Home/Foundation News/Kids to Camp Applications are Open! Kids to Camp grant applications are now open! The deadline to apply for 2019 funding is March 1st, 2019 at 11:59 pm. 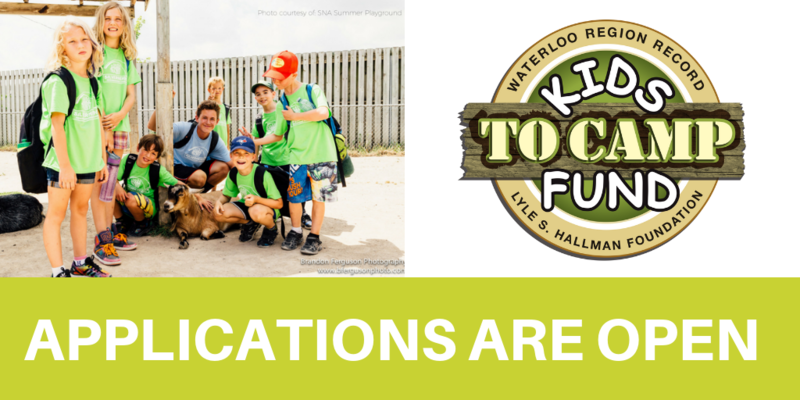 Established in 2004, the Waterloo Region Record-Lyle S. Hallman Foundation Kids to Camp Fund annually provides grants to local organizations for the purpose of enabling children and youth in need of financial assistance to attend a variety of overnight, recreational and educational camps. The Kids to Camp fund receives annual contributions from the Lyle S. Hallman Foundation, the Waterloo Region Record, and from generous individuals in our community. Every dollar received goes directly to fund camp subsidies. For more information about our Kids to Camp grants, click here. If you have any questions or need support with the grant application process please contact Adriana Van Oostveen at 519-624-8972 or by e-mail.